Since oil is the primary fuel of global industrial civilization, its imminent depletion is a problem that will have a profound impact on every aspect of modern life. Without international agreement on how to manage the decline of this vital resource, the world faces the unprecedented risk of conflict and collapse. 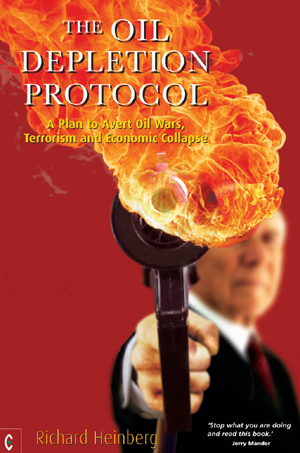 The Oil Depletion Protocol describes a unique accord whereby nations would voluntarily reduce their oil production and oil imports according to a consistent, sensible formula. This would enable energy transition to be planned and supported over the long term, providing a context of stable energy prices and peaceful cooperation. The protocol will be presented at international gatherings, initiating the process of country-by-country negotiation and adoption and mobilizing public support.  Provides an overview of the data concerning Peak Oil and its timing.  Briefly explains the protocol and its implications for the reader and for decision-makers in government and industry around the world.  Looks forward to how the protocol can be adopted and how municipalities and ordinary citizens can facilitate the process. Timely and critically important, The Oil Depletion Protocol is a must-read for policy makers and for all who seek to avert a Peak Oil disaster. RICHARD HEINBERG is widely acknowledged as one of the world's foremost Peak Oil educators. A journalist, teacher, editor, lecturer, and a Core Faculty member of New College of California where he teaches a program on "Culture, Ecology and Sustainable Community", he is the author of six previous books including The Party's Over, Oil War and the Fate of Industrial Societies and Powerdown, Options and Actions for a Post-Carbon World.